Amy Harris questions the traditions of the world's largest tennis championship and their relevance today. Every summer the BBC is taken over by coverage of the age-old contest, Wimbledon. From the all-white dress code and the freshly mowed grass courts to the tradition of strawberries and cream; Wimbledon is considered one of the only traditional sporting events that has maintained its roots, whilst (supposedly) simultaneously modernising itself to capture the attention of the nation. Yet, how modern can Wimbledon truly be considered when the most memorable aspects of Wimbledon’s charm lie in traditions created in the 1800’s? If anyone at the All England Club is asked why the female tennis players receive less notoriety and coverage, often being demoted to the outer courts with men’s tennis taking place in Centre court, the answer is always that the public would rather watch men’s tennis. Yet, surely this is nothing more than a self-perpetuating cycle. The event organisers insist that the general population prefer to watch the men. The general population tune into Centre Court expecting the most prominent names in tennis to be playing there, so when there’s see a lack of women rarely do they consider the fact that they may be missing out on amazing athletes. As a result, they do not ask for what they do not know they’re missing. For example, this year alone Jelena Ostapenko, the 20-year-old French Open winner played her game against 4th seed Svitolina on the 12th court. Now consider this, had Ostapenko been a man, would the event organisers ever have allowed a male French Open winner to play his match on an outer court? Therefore, while there is no questioning that Wimbledon is attempting to change with the times, it appears largely to be for show. While room has undoubtedly, even if by force of a modernising world, been made for women in Wimbledon the fact remains that, while the entire event is broadcast around the world for those unable to attend, attending Wimbledon is very much a high and middle-class honour. The most notable issue with the tradition of Wimbledon clearly shines through the issue of its scheduling and location. During the 2 weeks of summer in which The Championships take place the only day which does not have an event scheduled is Sunday, the traditional rest day, arguably one of the only days that a working person would be able to easily attend an event. Even if the scheduling allowed for a working-class viewer to attend, the cost of attending Wimbledon alone would be less than achievable for the everyday worker. The need to take time off work, buy train tickets to London (and/or arrange for some other form of transport) and somehow afford accommodation in Wimbledon or the surrounding areas, before even buying the ticket for a single event (with tickets for the centre court costing up to £129) Wimbledon is hardly accessible to the general population. Even one of Wimbledon’s most famous traditions, the strict dress code that requires “almost entirely white attire”, stems from the typical idea of tennis as a sport that displays the wealth of the player. An aristocrat would be able to wear the white clothes without laborious work ruing their original state. Along with this Wimbledon is the only sporting event in which the Queen issues rules on how to line up to enter the event. 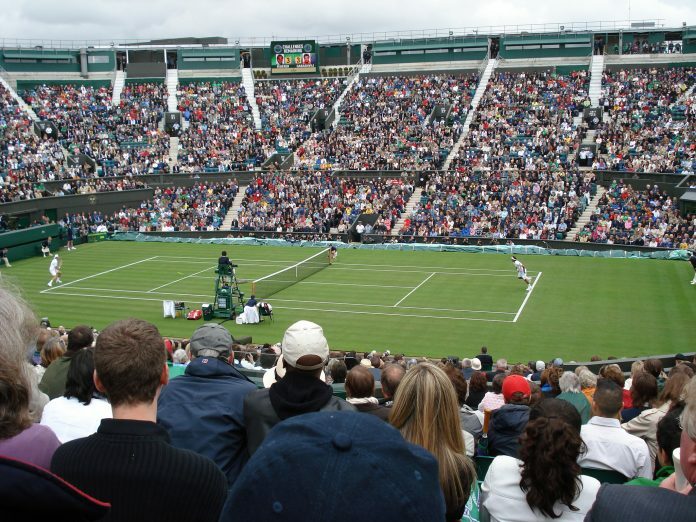 This combined with the notion of the “Royal box” in which you can always see members of the Royal family, even if this is one of the only places within Wimbledon which seats can often be found empty, combined with the all-white dress code and the general stuffiness of the event create an atmosphere unwelcoming to the average person. Wimbledon has come a long way from 1877; women can now earn equal prize money; commoners can attend; there is even an ex-commoner sitting presiding over Wimbledon as its Patron. But the fact remains that Wimbledon still has a long way to go before it can be considered modern. While tradition is needed and paramount in terms of Wimbledon’s importance, the prestige of tradition behind The Championships can often be just as off-putting as it is charming.